I know that there are people out there that could care less if one of their cloth diapers has a stain. Not me, I like to keep mine stain free because I never know when I will need to whip out a cloth diaper to show a layman how awesome they are! It’s not as impressive if poo stain is showing, lol. First, let me start by saying that a stain does not mean your cloth diapers are dirty. It just means it has a stain. I’ve seen plenty of new cloth users freak out over stains and I want you to know that they are nothing to worry about. I will ALWAYS recommend sunning first. It’s all natural and free, so also my favorite. You can’t believe how well this works until you see it with your own eyes! 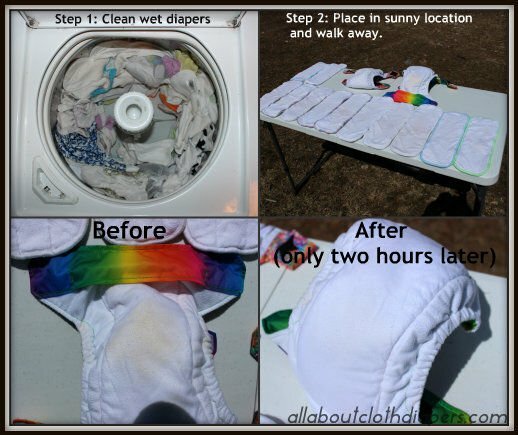 Ok, so you take your clean but stained diapers out of the wash. Place them still wet outside in a full sun area. You can either hang them or place them on a flat surface. That’s it… Mine are usually out all day because I forget about them. Once they are dry, most of the stains will have magically disappeared. If they haven’t you can just re-wet and repeat. This can even be done inside in front of windows or on cloudy days. Obviously, it will work better outside in full sun if you can. But it will even work on cloudy days…and from inside through a window. If one cycle in the sun doesn’t do it, I repeat the process but add lemon juice instead of water this time. Take plain old all natural lemon juice (can be found in the juice isle of any grocery store) and pour it directly onto the remaining stains. Make sure the area where the stains are is fully saturated. Place the damp insert back into your sunny location and walk away. Usually by the time it’s dry your stain will be totally gone. You should wash these inserts again as the lemon juice would burn if put directly onto little one. TIP: Inserts can get kind of crunchy when air-dried. A tumble in the dryer usually will solve that and if it doesn’t help you can add a little Mrs. Meyers or other plant based fabric softener to them. I originally found this in Bed Bath & Beyond in a small scrub bottle. It quickly became my favorite stain removing product and the best I’d ever tried! Even against anything mainstream that can be found in all grocery laundry section. I LOVE this stuff. Squirt a little on, give a little scrub if you can (if you don’t buy the one that comes with the scrubbing cap, just use an old toothbrush or scrub brush). Wash as usual. It even works wonders on my husband’s grease stained shirts. You can keep a bottle of this in your bathroom and just spray stains after removing solids and before placing in your wetbag. You can also spray directly into your pre-wash. Some children might be sensitive to this so be sure to only use in pre-wash so it has a chance to be totally rinsed out. Bac out uses live enzyme cultures and lime extract to remove stains and odors from just about anything. If you have never tried it, you need to. It will remove stains from anything including carpets and clothing. 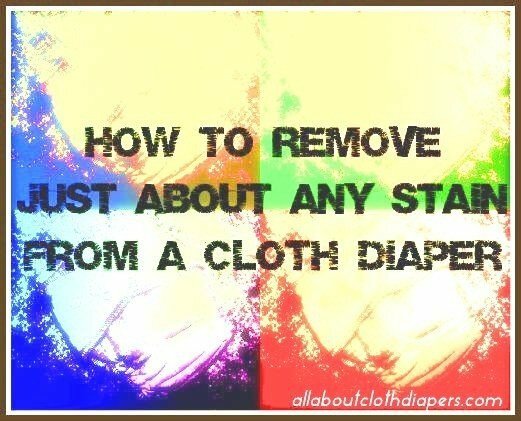 Click here to see step-by step instructions to use it to remove stains from cloth diapers! I am an Oxiclean user. I prefer the free version because I found it to not suds up as much and also to be easier to rinse out. I have hard water and I had problems with ammonia burns and stink. Added Oxi to my routine and it solved those issues for me. It is also great at removing stains on cloth. To remove stains fill your washer or tub with water and add clean but stained diapers. If your washer doesn’t have a soak cycle, just add water in a wash and then stop the washer. Add one scoop of Oxiclean; agitate or stir a little to mix it in and then let it sit overnight. Then throw in wet bag or pail and wash it with the rest of your diaper laundry. FYI, any commercially available stain treater is safe to use on cloth diapers. Just be sure to follow the package’s directions. I honestly really don’t recommend bleaching just for stains. It’s harsh on fabric and is overkill in this case. There are gentler things to use that will get the job done. Remember, if after all this you are still unable to remove a stain, it won’t affect a diaper’s function at all. Have you ever tried any of these techniques with success? What is your favorite stain removal method? I think lemons are the best for the removal of stains along with detergent. I have a few things to add that have not been mentioned. Front loading HE washer are notorious for having a stink problem. You will have to check on your washer, call the manufacturer, but ours suggests leaving the door open a jar. I just leave our open when not in use so it can dry out. Occasionally I do a “tub wash” cycle with only bleach. You can buy special front loader washes, but the manufacturer suggests bleach. Afterwards wipe all the seals with a bleach solution. I was grossed out by all the mildew in mine the first time I did this. Ours also has a drain down at the bottom that they recommend draining once a month. I follow this washer cleaning with a load of whites just in case there is any bleach residue. Once I started doing this regularly, the stink in damp clothes mostly disappeared. Already mentioned, it may also be the water. We are on a well and didn’t have a softer or filter our system till recently. Hard water smells and the minerals leave a grey cast to whites. No one has mentioned yet that some fabrics stain more than others. My gDiaper inserts never seem to stain, yet my bamboo ones all have mustard colored stains. My microfiber ones seem more inclined to smell. If I had to do over, I would only buy the charcoal grey inserts and dark colored covers without white interiors. Wish someone had mentioned that to me beforehand. Thank you! I have never heard this! So, I just looked up how to clean my washer (samsung), and it gave the same instructions you did. Im a little worried, I’ve never cleaned it before. Guess what I’ll be doing tomorrow! DO it! The results are so satisfying! I bought some used Smart Bottoms not realizing they had shadow stains. They have a light brown stains in the middle. I can’t get rid of them and they gross be out since it’s not from my baby (I realize this is ridiculous). I tried sunning, lemon juice and peroxide. Should I bleach? And other recommendations? They might be iron stains from hard water. It’s hard to say. Is it just an insert or an AIO? Will these techniques work even if the inserts have been in the dryer? I have used cloth diapers that I wash with Eco. I rinse once on super with cold water, and then I wash with hot water and then I rinse it once the cycle ends with cold water. And then I let them dry in the babies room. And I dry the inserts and cloth wipes in the dryer. But randomly I will have the elastic loosen and won’t be snug around my daughters thighs. (And I have to throw them to the side to not use) and just recently we bought charcoal cloth inserts and it turned my diapers dark grey.. on top of the yellow stains that were already forming. I am here because I need more guidance on if I’m doing things right/ what I can do to do things better and get the grey out of the diaper and repair diapers that aren’t fitting right anymore! Stains don’t mean dirty. It just means stained. Put them in the sun wet or even on a cloudy day and the stains will magically disappear. As far as the elastic it depends. Elastic is usually the first to go on a diaper. If they are very used then I say it might be normal. Or it could just be bad elastic if they are newer. Or washing in very hot water can weaken them. It may be the detergent in the uk we have ecocover which isn’t recommended as it destroys elastic. Hi. I am just getting ready to begin cloth diapering. I have read that soaking them will ruin the elastic but I see that you are all for soaking. Can you weigh in on this for me?? Thank you!! I’m for occasional overnight soaks. Either for stains or in the case of build up. The kind of soaking you are talking about is when people store their dirties for wash day. That means the diapers are sitting in water for days after each use prior to washing. And yes that kind of soaking can damage elastics. It’s also a drowning hazard if there isn’t a lid involved. I have been using cloth all along for my now 2 yr old. A lot of times if I don’t have enough diapers to wash I will put the little kids clothes in with them to give everything something to rub up against. This time around I guess I put something in that bleeds and now most all of my cotton diapers are PINK! will the above methods work with dye stains? Halp! I’m so discouraged. I have brand new bum geniuses I did the 5 wash before use. First wash was accidentally cold with 1/2 normal amount of Ecos soap, then two hot soap washes, then two hot no soap cycles. About half of them came out with light brown stains!!! They haven’t even been used. Why? What do I do? Do you have hard water? Did anything accidently end up in the wash with them? Won’t colored or pretty designs on cloth diapers get ruined from the oxiclean or bleach if you soak them? Very new to this. Thanks so much! This is sooo helpful. My diaper have had some stains. I’ll try suning them. Thanks! Now I have a HE washer, do multiple washes and use the dryer of course. So what do I have now? Stains, stink, ammonia build up, you name it. Such a pain. The sun is definitely the way to go. I’m going to try lemon on some used CD I purchased, (I actually bleached them, but they still have stains). But what about ammonia? Should I use oxiclean? How often? Thanks!! 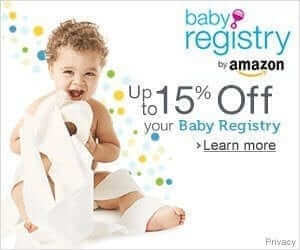 I recently cancelled my diaper service. I used to throw all my dirties in a bag and once a week I’d leave it on my doorstep. The diaper fairies would come and leave me a stack of perfectly clean prefolds. Now, I’m washing cotton prefolds myself. It’s harder than I anticipated! They are deeply stained. When should a diaper be rinsed? When can they wait and then go in the washer? I usually try sunning first then, if it needs some extra help I will either oxiclean or a little clorox 2 if still no progress i pull out the fels naptha bar and go to town. 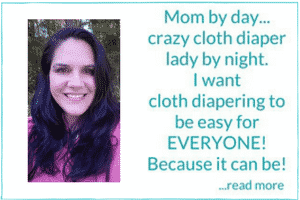 I had never heard about sunning out stains until I discovered cloth diapering! How amazing is nature?!!? I also learned that the sun is a natural disinfectant. So fabulous! I have not started cloth diapering yet but honestly one of my biggest fears was stains and looking “unclean”. Not anymore!!! That’s awesome! I was the same way. Now I throw out the shirts with stains, a few hours in the sun and it’s like magic! Good luck Amber! I use prefolds and flats on my two year old. There are many days when we have 4+ poopy diapers. If it is solid enough to plop in the toilet, the stain usually comes out after sunning. If the poop is PB consistency (we scrape it off into the toilet), the diaper comes out of the wash (soak overnight, rinse, full cycle, rinse) seriously stained and only get slightly better with sunning. I usually set them aside to spray down with oxiclean for the next load of diapers. After the second round of washing and sunning, they are usually void of stains or have only minor ones remaining. Do you have any suggestions to help me cut out some of this extra laundry? Hi Mary, Great question. First a stain doesn’t mean that the diaper is dirty or any poo is remaining. It is what it is…a stain. They don’t affect the function of the diaper at all, just the way it looks. Obviously, if it bothers you then you are doing what you have to to get them out already. But otherwise I wouldn’t worry too much. I usually wait until I have a bunch that are stained and then I will sun them all at the same time. If sun doesn’t work, I rewet and pour some lemon juice on them and then sun again. 99% of the time that works. Not exactly what you were asking, but I hope it still helps! I’m a first time mom new to all things baby. You said you wait until you have a lot of things that need to be put in the sun to lay them out. In the time you wait to do that does the stain set it and get harder to remove? I have some poop stained things I want to run right now, but we’ve had rainy day after rainy day and I’m afraid the stain is only going to be that much harder to get out while I wait for the sun to shine again! Hi Megan, Just wash them and the next day it is sunny re-wet the stained diapers with water and sun. If the stain is there after it dries just r-ewet again or you can try lemon juice instead. Just wash after the lemon juice so you don’t burn baby. I’ve not yet found a washing combination that removes all newborn mustard poo stains. Sunning has been my saving grace all summer long. Now that fall and winter are approaching, what can I do to get the stains to up and leave? I’ve always used sun for stains, it never ceases to amaze me just how well it works on poo stains, particularly that yellow newborn poo. I’ve never thought of using lemon juice though, what a great idea. It makes perfect sense, I’ve heard of people using lemon juice with the sun to lighten their hair, and imagine it would work really well on stains too. I always sun my diapers as much as possible. I’ve had really good luck this third time around (except with my GroVia AIO) with my diapers just not staining much. I think the only difference is with my first two babies’ diapers I didn’t do a warm pre-rinse before washing my diapers. Now I do it every time and I think that’s making a difference.